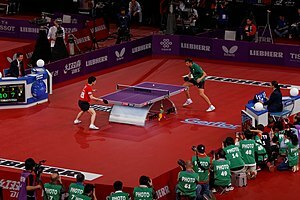 Table tennis, an aa kent as ping pong, is a sport in which twa or fower players hit a lichtwecht baw back an forth athort a table uisin a smaw paddle. The gemme taks place on a haurd table dividit bi a net. Except for the ineetial serve, the rules are generally as follaes: players must allae a baw played taewart them tae bounce ane time on thair side o the table, an must return it sae that it boonces on the opposite side at least ance. A pynt is scored when a player fails tae return the baw within the rules. Play is fast an demands quick reactions. Spinnin the baw alters its trajectory an leemits an opponent's options, giein the hitter a great advantage. This page wis last eeditit on 20 August 2016, at 16:59.